Musina Hotel and Conference Centre is a timeless classic. The hotel showcases a refined taste and creates a memorable experience for the weary traveller, tourist passing through en route to Zimbabwe, family on vacation or business executives. South of Musina on the N1 road, the Hotel welcomes guests from all over the world to have a peaceful rest and a fine dining experience. Musina hotel aims to surpass expectations of our guests by providing personalized and memorable experiences. Our customers are our priority and we will provide them with quality experience which is second to none. We aim to surpass expectations of our Guests by providing a personalized and memorable experience. We recognize the importance of our employees in achieving this and we will create a positive working environment which encourages their loyalty, commitment and hard work. We strive to be excellent leaders and will undertake all our business activities in an honest and ethical manner to provide a fair return on our investments. To become the leading Hotel in Limpopo providing excellent products and services at reasonable prices to every customer every time. Musina Hotel has been voted a Best Value Establishment for where to stay in Musina accommodation. 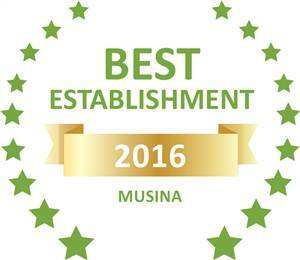 Based on reviews of establishments, Musina Hotel & Conferencing has been voted Best Establishment in Musina for 2016. Make yourself at home in one of our 52 air conditioned rooms featuring refrigerators and flat screens televisions. Bathrooms with showers are provided in each room. Convenience includes a desk with chair and tea/coffee making facilities. At Musina Hotel, guests will be able to enjoy the beautiful gardens and private swimming pool area. Guests can daily enjoy a satisfying meal in our Restaurant. The Hotel offers room service and our well known ‘Copper Bar’ is available for all refreshments and drinks to quench your thirst. We have two Conference Venues named ‘Shaft 1 and Shaft 2 ‘ that can accommodate set ups for various functions. Musina Hotel is also home to one of the world’s best car hiring companies – Avis/Budget. Our friendly staff will ensure that you get a vehicle to use at very affordable rates. Musina is the most northerly town in South Africa and the last town before the border to Zimbabwe. Beit Bridge Border Post, South Africa’s busiest border post, lies on the Limpopo River some 18km north of Musina. The town developed in tandem with the Copper Mining Industry. The Bushveld climate is ideal for growing citrus, mangoes and tomatoes. Archaeology, wildlife, hunting or the impressive baobab trees and Impala Lilies are excellent reasons to visit the town and surrounding areas. Musina experience a hot semi-arid climate with hot temperatures most of the year. Rooms are surrounded by 3 hectares of lush gardens, exotic flowers and palm trees, Guests may choose the very comfortable elegance of our Luxury Rooms, Deluxe Rooms, Standard Rooms or a simpler Budget/Self Catering Rooms. The preferred conferencing venue in Musina. Named in honour of the rich mining history of Musina, the Hotel has two Conference Venues – Shaft 1 and Shaft 2. Venues are modern and will ensure that you have a successful conference or meeting. Avis Budget Group, Inc. is a leading global provider of vehicle rental services, both through its Avis and Budget brands. Take the N1 to Polokwane. Continue on the N1 to Louis Trichardt (117 km). Carry on to Mopani (68 km). Carry on to Musina (30 km). Just after entering Musina Town, Musina Hotel will be situated on your left hand side. Head south on the N1 and continue for 28.6 km, passed Musina. The hotel will be on the right-hand side.